“They” say that everyone complains about the weather, but no one can do anything about it. I suppose the same thing can be said about the price of gas, but that will not keep me from throwing in my two cents, which would only buy me about one-third of one ounce of gas anyway. “They” say – that indefinite third person plural that appears to be all-wise and all-knowing – that the price of gas is coming down and that I should be happy it has stayed under $4 a gallon. I say that is a lot of bosh – bosh being the term regularly used by Mr. Sherer, my first boss, to refer to things that just did not add up. I think it was in 2008 that oil was around $150 a barrel and “they” said then that was justification for gas costing $4 a gallon. So one would think that six years later, oil must still be around $150 per barrel, right? Wrong! According to Yahoo! Finance, crude oil ended trading today at $97.69. 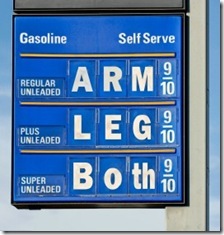 So, if one applies the logic that $150/barrel = $4/gallon, then $97.69/$150*4= $2.61! So, forgive me if I am not ecstatic and thankful that gas is dollar more than the logic “they” provided says it should be. I am also not overjoyed that my trash bill has recently added a fuel surcharge – in addition to the full surcharge that they added in 2008 when gas was at $4.00. If I knew who to ask, I would inquire about the logic used to add a fuel charge on top of the previous fuel charge when the price of gas is less than it was when they added the original fuel surcharge?? I know, none of this changes anything, but it makes me feel a tad better to vent, now about that weather….. This entry was posted in Humor on August 5, 2014 by Leonard. I too think it’s all a bunch of bosh, and thanks for giving me a new wordin my vocabulary!